1st item: European porcelain figure of a gentleman depicted standing on a naturalistic base. Incised numbers to base along with an illegible blue mark. 5" H. 19th century. 2nd item: Edme Samson Chinese Export style porcelain sauce boat having enameled floral decoration and entwined handle. Red Samson marks to the base. 5 1/4" H x 7 1/2" W. 20th century. 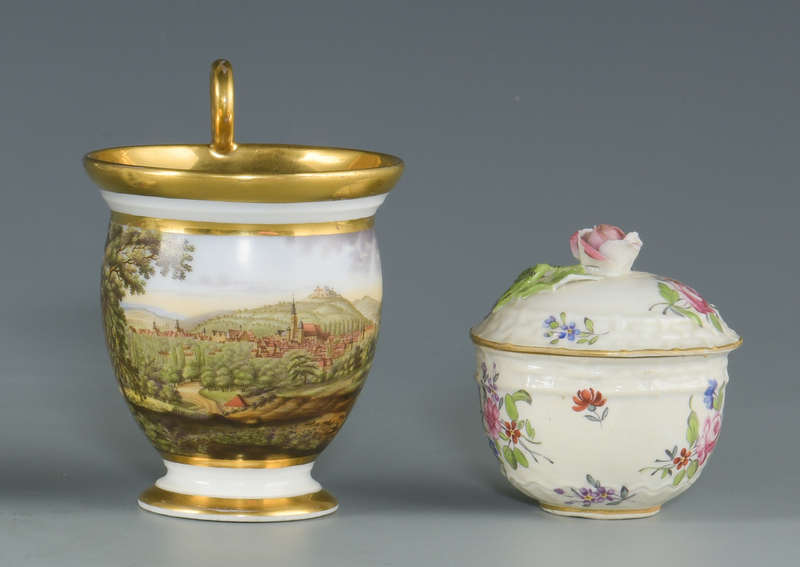 3rd item: European scenic porcelain cup with hand painted mountainous village scene and gilt scrolled handle with lion's mask. Base with incised marks or numbers. 4 1/4" H. Early 20th century. 4th item: Small Meissen round covered jar with rose finial and floral decoration. Blue underglaze crossed sword mark to base. 2 3/4" H. Early 20th century. Provenance: Private Knoxville, TN collection. CONDITION: 1st item: Old breaks to hat, tip of coat and wear to paint on base. 2nd item: Very light wear to gilt, very good condition. 3rd item: Very good condition. 4th item: Breaks to flower on lid, minute chipping to the base.